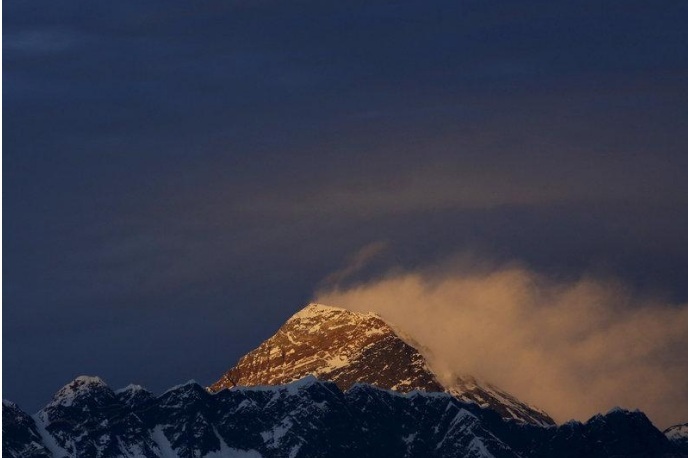 FILE PHOTO - Light illuminates Mount Everest, during sunset in the Solukhumbu District also known as the Everest region, November 30, 2015. KATHMANDU - Nepal will measure Mount Everest afresh to settle a controversy over height of the world’s tallest peak, especially after some estimates suggested it became a little shorter in the wake of an earthquake two years ago, officials said on Friday. Nepal, home to Mount Everest and half of the world’s 14 highest mountains, has never measured the peak on its own and uses its snow height of 8,848 meters (29,028 feet) that was measured by the Survey of India in 1954. Many Western climbers use the height of 8,850 meters (29,035 feet) determined in 1999 by the National Geographic Society and Boston’s Museum of Science, in a survey that used satellite-based technology to measure the peak. Everest straddles the border between Nepal and China, and in 2005 Chinese mountaineers and researchers put its height at 8,844.43 meters (29,017 feet). Ganesh Prasad Bhatta, director general of the Nepal government’s Survey Department said an expedition would be made next year to settle the debate. “We are now developing a methodology for the measurement which will be discussed with international experts, and their advice will be incorporated to make sure that our work meets global standards and is internationally accepted,” Bhatta told Reuters. He said Nepal lacked scientific tools like Global Positioning System and leveling equipment as well as gravimeters, but would hire what was needed from experts and agencies like the International Association of Geodesy. “If the weather conditions on the mountain are good, we will start the work in the summer climbing season next year or in the Autumn of 2018,” Anil Marasini, another official with the Survey Department, said. Officials said they would seek to establish whether a 7.8 magnitude earthquake in April 2015 had altered the mountain’s height. The earthquake occurred during the peak climbing season, and massive avalanches killed 18 people at the base camp. During the summer mountaineering season this year, some climbers said the Hillary Step - a near vertical rock formation below the summit - had collapsed, though the Nepal government has rebutted those claims. Nepal will measure Mount Everest afresh to settle a controversy over height of the world’s tallest peak, especially after some estimates suggested it became a little shorter in the wake of an earthquake two years ago, officials said on Friday.